Izadi, A., Mosayebi Dorcheh, S., Rashedi, H. (2015). Substrate Diffusion Analysis in Immobilized Spherical Cell-Support Aggregate by Using of Least Square Method. Journal of Applied Biotechnology Reports, 2(2), 245-250. Ali Izadi; Sobhan Mosayebi Dorcheh; Hamid Rashedi. "Substrate Diffusion Analysis in Immobilized Spherical Cell-Support Aggregate by Using of Least Square Method". 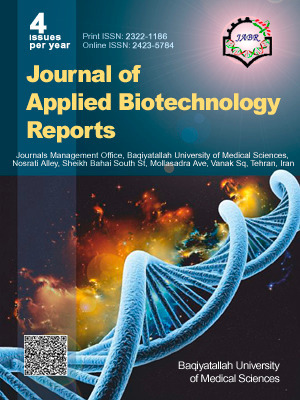 Journal of Applied Biotechnology Reports, 2, 2, 2015, 245-250. Izadi, A., Mosayebi Dorcheh, S., Rashedi, H. (2015). 'Substrate Diffusion Analysis in Immobilized Spherical Cell-Support Aggregate by Using of Least Square Method', Journal of Applied Biotechnology Reports, 2(2), pp. 245-250. Izadi, A., Mosayebi Dorcheh, S., Rashedi, H. Substrate Diffusion Analysis in Immobilized Spherical Cell-Support Aggregate by Using of Least Square Method. Journal of Applied Biotechnology Reports, 2015; 2(2): 245-250. In this study, the substrate diffusion in an immobilized spherical cell-support aggregate is studied and effects of various parameters are investigated on substrates profile. Analyses are performed by using of an analytical solution called the Least Square Method (LSM) and results are compared with numerical solution. The effects of effective diffusion coefficient (De), maximum specific growth rate (µm) and type of limiting substrate are studied on substrate concentration profile in immobilized Nitrosomonas europaea and Nitrobacter agilis microorganisms. Outcomes reveal that LSM is an appropriate method for analyze of biological non-linear equations. In the center of the spherical microbial support, the substrates concentration is minimums and with reducing µm or increasing De, substrate concentration profile gradient reduces.